Designed to make more out of every drop. Optimum® AQUAmax® products work, rain or shine. The drought yield leader. Proven in the field with over 107,000 on-farm competitive comparisons since 2011. Optimum® AQUAmax® products were planted on over 9.2 million acres in 2017. Learn more about a robust lineup of over 80 Optimum AQUAmax products ranging from 95- to 114-day comparative relative maturity (CRM). Source: From 2011-2017, Pioneer® brand Optimum® AQUAmax® products were grown in 107,864 on-farm comparisons across the United States against competitor brand products (+/- 4 CRM). Water-limited yield data includes 6,795 competitive comparisons with a win ratio of 65 percent, and favorable environment includes 101,069 competitive comparisons with a win ratio of 56 percent. 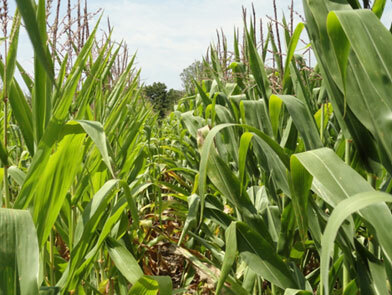 Water-limited environments are those in which the water supply/demand ratio during flowering or grain fill was less than 0.66 on a 0-1 scale (1=adequate moisture) using the Pioneer proprietary EnClass® system and in which the yield average of competitor brand hybrids at the location was less than 150 bu/acre. Favorable growing conditions are locations where yield levels were at or above 150 bu/acre on average, regardless of water supply/demand ratio. Precipitation levels are interpolated values based on local weather stations. Product performance in water-limited environments is variable and depends on many factors such as the severity and timing of moisture deficiency, heat stress, soil type, management practices and environmental stress as well as disease and pest pressures. 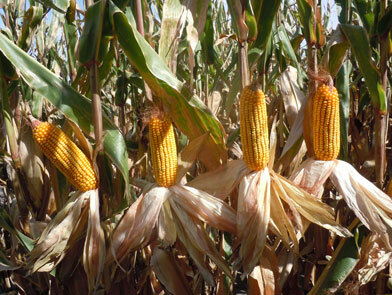 All hybrids may exhibit reduced yield under water and heat stress. Individual results may vary. Prolific silking, minimized leaf rolling, deeper kernels, and an efficient root system characterize Optimum AQUAmax product performance to make more yield from every drop. Competitive product bottom left. 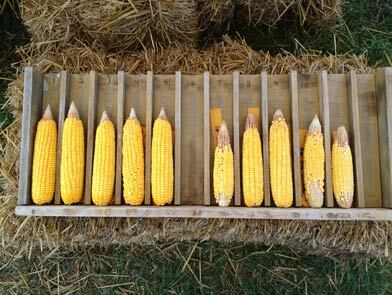 Pioneer® brand Optimum® AQUAmax® product P1498YHR(br) pictured top right. Location: Easton, Md. Photo taken week of July 29, 2012. 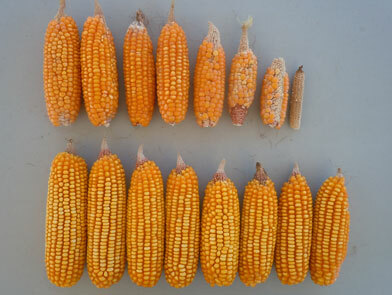 Competitive hybrid on the left and Pioneer® brand Optimum® AQUAmax® product P1151AM on(br) the right. Location: Buchanan County, Iowa. Photo taken August 2012. Competitive hybrid (left), Pioneer® brand Optimum® AQUAmax® product P1498 (right) in(br) Fulton, Ky. Plant population 25,000 plants per acre. 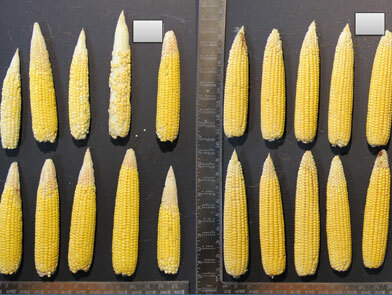 Competitive hybrid on top, Pioneer® brand Optimum® AQUAmax® product P1498AM-R on(br) bottom. DuPont Pioneer Agronomy Sciences side-by-side demonstration plots. (br) Location: Johnston, Iowa. Photo Taken: Sept. 10, 2012. Pioneer® brand Optimum® AQUAmax® product P1498HR on the left and P1420HR hybrid on the(br) right from a DuPont Pioneer intensive corn management demonstration. Average yield advantage(br) for P1498HR was 27 bu/acre. Photo Taken: Aug. 13, 2012. 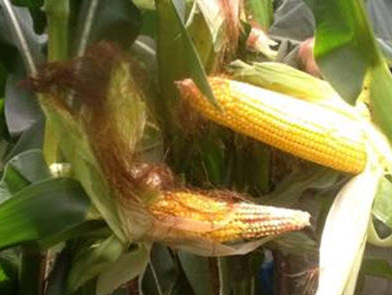 Husked back ears in the Pioneer® brand Optimum® AQUAmax® product P1498AM-R DuPont(br) Pioneer Agronomy Sciences side-by-side demonstration plots. Location: Johnston, Iowa. (br) Photo Taken: Sept. 19, 2012. Glenn Haag from Lewiston, Minn., talks about the advantages of planting Optimum AQUAmax hybrids from DuPont Pioneer. He doesn’t have to babysit this drought-tolerant hybrid. Cary Hajek from Tyndall, S.D., talks about the advantages of planting Optimum AQUAmax hybrids from DuPont Pioneer. After placing second last year, he’s hoping this drought-tolerant hybrid brings him first place. Kenton Johnson from Granite Falls, Minn., talks about the advantages of planting Optimum AQUAmax hybrids from DuPont Pioneer. Now this drought-tolerant product is at the top of his hybrid totem pole. Matt Melburg from Hector, Minn., talks about the advantages of planting Optimum AQUAmax hybrids from DuPont Pioneer. This drought-tolerant hybrid handles stress so well he sleeps better at night. Mike Rowan from Huron, S.D., talks about the advantages of planting Optimum AQUAmax hybrids from DuPont Pioneer. This drought-tolerant hybrid doesn’t miss a lick. Chris Davis from Wisconsin Dells, Wis., talks about the advantages of planting Optimum AQUAmax hybrids from DuPont Pioneer. You have to come see this drought-tolerant hybrid. Growers from Minnesota discuss the way Optimum® AQUAmax® hybrids use water more efficiently to provide higher yield potential. Growers and Pioneer sales professionals from Maryland talk about their experiences with Optimum® AQUAmax® hybrids in tough growing conditions. For the first time in 30 years, an area in one field didn't "burn." Despite extreme heat at pollination, the plant health, ear retention and performance of the Optimum AQUAmax hybrid was astonishing. The Optimum AQUAmax hybrid had great standability, good drydown, it stayed green despite heat stress and produced more bushels. It’s a total package. Compared to other hybrids, the Optimum AQUAmax products were able to survive longer under the drought conditions and were able to produce grain. Across nearly 900 acres of competitive comparisons, Pioneer® brand Optimum® AQUAmax® (P1151HR) hybrid showed an 8.7 bu/A yield advantage over competitive drought hybrid. DuPont Pioneer Senior Marketing Manager Reed Mayberry shares yield results. Watch a Pioneer® brand Optimum® AQUAmax® hybrid growing side-by-side the competition! Equipped with strong agronomics and the latest technology packages, Pioneer® brand Optimum® AQUAmax® hybrids are designed to make more out of every drop. Watch this short video to see how The Drought Leader optimized water under dry conditions in the Western U.S. Corn Belt during summer 2013! Drought Stress Plot in LaSalle, Colo. 2012. Pictured Right to Left: Full Irrigation (Full); water not limited. Vegetative Stress (Veg); stress from V6 to V12. Flower Stress (FS); water was held off about 1 week before until 1 week after flower then re-watered. Grain Fill Stress (GFS); irrigation was stopped after 175 GDUs post-flower. No additional water was added. Agronomics, plant density knowledge, and water management are cornerstones to product development and help provide the best management practices for growers. DuPont Pioneer researchers discuss how Optimum® AQUAmax® hybrids are designed to deliver rain or shine. Growers and Pioneer sales professionals from Kansas, Nebraska and Missouri talk about the resilient traits built into Optimum® AQUAmax® hybrids.